The government will make a major u-turn over the much-derided condition of funding rule, FE Week can reveal. From August 2015 all 16 to 18-year-old students with a GCSE grade D have had to study and resit the GCSE as part of the condition of funding, rather than a functional skills qualification at level two. But once this policy has been scrapped, no student will be forced to resit GCSE English and maths. The latest revelation follows scathing criticism of the policy from Ofsted in December, and publication of a letter from education secretary Justine Greening to Neil Carmichael, chair of the Education Select Committee, advising on changes to the numeric GCSE grading system. The letter revealed very little new, but FE Week has been told by multiple sources that the current policy to force some students to resit GCSEs will be scrapped – so all students can study functional skills, as was the case before 2015. Although not mentioned in the letter, this will be confirmed in the funding guidance for 2017/18, due for publication shortly. It comes just a few weeks after the government finally confirmed another u-turn on the requirements for early years educator apprenticeships. Currently early years learners must achieve at least a grade C in English and maths GCSE to pass the level three course, but FE Week reported in early March that from April this will be broadened to include functional skills. 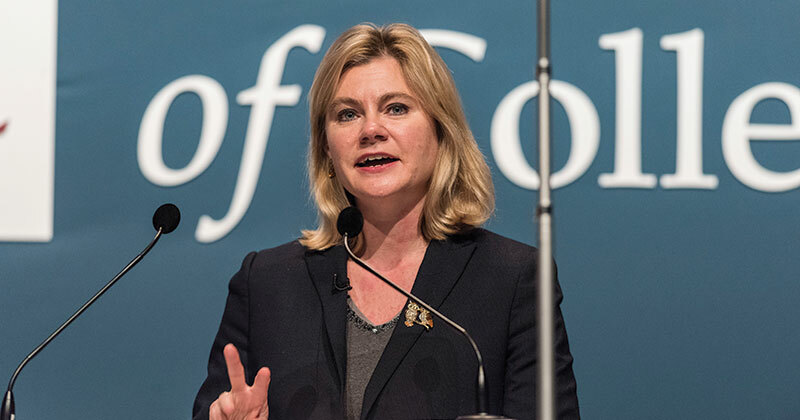 He added: “The new chief inspector for Ofsted has quite rightly joined many stakeholders in the FE and skills sector and employers, in raising the possibility of the policy being abandoned altogether, and we feel that Ms Greening could have responded to this challenge more positively [in the letter]. Ofsted was highly critical of forced resits in its 2016 annual report published in December, as reported in FE Week. It said: “While the policy’s intention to improve literacy and numeracy levels is well intentioned, the implementation of the policy is not having the desired impact in practice. “Inspection evidence shows that, for some students, having to retake their GCSE can be demotivating and that attendance at these lessons is lower. Commenting today on Ms Greening’s letter, Catherine Sezen, senior policy manager at the Association of Colleges, said it was useful to “finally have clarity” over the new GCSE grading. “This will give guidance to colleges on entry requirements and GCSE resit policy and to universities and employers for their entry and job role requirements,” she said. Ms Greening said in the letter that “under the new system, a grade four and above will be equivalent to a C and above. She previously gave strong hints about a change of heart towards the English and maths resit policy, at last November’s AoC conference (pictured). Apprenticeships and skills minister Robert Halfon also conceded to delegates that GCSEs are not always the best option for FE students. “It is clear that we need a credible, high-quality option for students for whom GCSEs are not appropriate or achievable,” Mr Halfon said. They were told that there were insurmountable problems associated with forced GCSE retakes. Sis they listen? Of course not. Yet another U turn, which is welcome, but how much damage has been caused in the meantime? Clueless politicians and civil servants ignoring good,balanced advice from experienced practitioners always ends up in a shambles: when will they learn? If professional teachers had been listened to instead of relying on an academic with no experience of working in the FE sector many students could have been saved the experience of studying for a GCSE that they could not achieve. This fueled their feelings of being ‘stupid’ and ‘thick’ – comments that I have had to endure on a daily basis. I have become completely demotivated and disillusioned – having to implement the ill-considered plans of Woolf. I hope she takes on her conscience the distress that she has caused these students. If English and maths is so relevant for employers why will apprentices have to do them outside of the 20% off the job hours! This policy was instrumental in me quitting as an English teacher in FE when we were told that we would be accountable for success rates even if we didn’t agree with the policy! Whilst this is only for ‘weak’ providers, Functional Skills Level 2 is no panacea. Good, at last a decision that makes sense and crucially, will allow learners the chance to progress in English and maths. Too many are forced to fail and fail again. Just wondered the provenance of this before we start retimetabling? Robert Halfon MP has not revealed a change in policy at the AoC Spring Policy Conference today. DfE, Ofsted and ETF colleagues have no inside knowledge. So why is this being stirred up without reference to a policy change? I teach GCSE maths at FE. We were going to spend the Easter Holidays planning for next year. Now we don’t know what to plan! Will we all go back to teaching functional skills? It is god to recognise that GCSE resit is often demotivating for good students who can get more relevant mathematics and use of English. The review of Functional Skills however needs to ensure that they are also fit for purpose for university; vocational students often reach the grades in heir specialist subject and under this change will only do Functional Skills. We need them recognised by universities as a valid entry qualification to maintain access for academic and vocational students. Consider naming them Technical English and Technical Maths? This probably means more pupils in secondary schools will work towards passing their GCSE Maths in year 11. Presently they say it doesn’t matter if I fail at 16 ’cause I’ll be doing it ’till I’m 18 anyway! So after two years of recruiting and training GCSE English and Maths – are we now to make them all redundant ? FE students should be given the choice of whether they resit a GCSE or take a Functional Skills as an option. I agree with the scrapped policy in the way that students who have achieved a ‘D’ first time around should resit as potentially they can achieve a ‘C.’ However, students with an ‘E’ or below will have little realistic chance of ever getting a ‘C’ grade and should automatically study Functional Skills. For students needing or wishing to gain the elusive GCSE ‘C,’ FE colleges should discuss with the student / parent carer which exam option / board will be the student’s best option, along with the optimum time to take the resit, ie, November, January or May and June. Totally agree! (Phil you clearly have no idea). My son has been desperate to work whilst attending his electrical course at college. Unfortunately he has been forced to attend and retake both Maths and English which has meant no time left in the week to work with an electrician and gain valuable experience (as well as earn some money). The whole experience has been demotivating and humiliating for him and many of his peers. His Electrical Tutor says that he is an incredibly capable budding electrician with a lot of potential. Why on earth was all the advice against this idea, from teachers, employers and OFSTED ignored!! So very arrogant, naive and short sighted of our government. Level 2 next year and no retakes.. Yey! My grandaughter is dyslexic and will be sitting her gcse this year may and June. She struggles with maths and English comprehension. She is allowed 15 minutes extra in each eaxam,which I feel is not enough. Does she really need to sit the exams again cone November or next year?? Forgot to mention she is only 15 when she sits her gcse this year. Too many people in central govt covering their positions .. I am concerned that the GCSE wasn’t always being implemented with the right criteria in place, we went from IGCSE to the new spec in one year. Having just read my providers literacy strategy I see that reading is high on the list. If it is just for functional skills we will end up reading purely vocational literature which is at it’s best functional. I have enjoyed bringing literature of good quality to my GCSE students, for some it is the first time they have ever accessed good literature and they have thoroughly enjoyed the experience. For many though the GCSE has been a lesson they would prefer to avoid. I will be sorry to see it go and agree that young people who achieved a D grade should at least be given the option to re-sit. I like the 8700. Well the funding guidance for 2017/18 has now been published and the condition of funding remains, with the rules on mandatory GCSE resits for Grade D (or Grade 3 under the new GCSEs) students still intact. Was this article an April Fool posted a few days early? It’s really good for people like me to give them ideas on how these subjects can be delivered. I’m also a parent and think that the comments above are symptomatic of the problems teenagers face day to day. Resits can be sole destroying. Our county council keeps refusing him an educational Health and social care plan saying that his needs are fully met which they are not. He gets some extra time and a scribe and he still cannot get beyond a D grade. If he has to study it this year to get funding for an art course he will miss out on valuable work experience. It is exhausting. Micheal Gove should be put in the stocks for torturing and dooming these children to failure.